This section contains the County Administrator's budget message which outlines key features of the FY2006/FY2007 biennium budget and a discussion of past and futures challenges in budgeting. The message also discusses underlying administrative practices that support the County's budget goals. This section also includes the approved budget ordinances for both years of the biennium. The Budget Highlights section contains a comprehensive analysis of revenues and appropriations for all funds. This section summarizes the overall financial condition of the County's major funds. About the Cover: The cover was designed by Anna Henderson and Susie Wells of the Greenville County Information Systems Division. 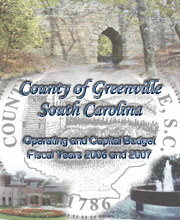 The central focal point of the cover is the Greenville County government seal. The bridge depicted at the top of the cover is a picture of the Poinsett Bridge, built and designed by Joel Poinsett in 1820. It is believed to be the oldest surviving bridge in South Carolina. Poinsett was an early resident of Greenville and a U.S. Ambassador to Mexico. The Poinsett Bridge is listed on the National Register of Historic Places. In the lower left hand corner of the cover is a picture of the South Carolina Governor's School for the Arts and Humanities. The Greenville campus was built in 1999 along the banks of the Reedy River. The lower right hand corner shows a picture of one of the beautiful fountains in downtown Greenville.